Bangladesh police laid siege to a five-storey building where suspected militants belonging to an Islamist group behind the country's worst terror attack were holed up. DHAKA: Explosions and gunshots rocked a city in northeastern Bangladesh today after police laid siege to a five-storey building where suspected militants belonging to an Islamist group behind the country's worst terror attack were holed up. A team of counter-terror officials from the capital Dhaka surrounded the building in Sylhet at 3 am. "Sounds of intermittent explosions and gunshots rocked the area since morning as militants preferred not to give up," a journalist told PTI. 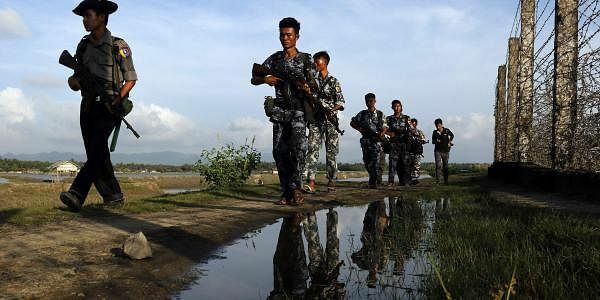 "We have come to know that female militants are also there," Sylhet's police commissioner Golam Kibria said, adding that preparedness was underway to launch a full scale raid to "neutralise" the extremists. Officials said 12 families were staying in the building. "We are proceeding with utmost caution so that the innocent residents are not hurt," a police officer told reporters. The police headquarters recently circulated a list of nearly 5,000 suspected militants to district police chiefs as part of a nationwide anti–militancy drive. Bangladesh witnessed a spate of attacks on secular activists, foreigners and religious minorities since 2013. The country launched a massive crackdown on militants specially after the Dhaka cafe attack.